Yes, it's my turn on the Dog Gone Cute blog hop! Thank you Lorna for inviting me to participate! And if you want to make your own, all of the instructions are on the Sew Fresh Quilt blog. So now, for the main event of the dog bone tutorial! And when you are finished, it will look like this! It finishes at 6 by 12 inches. After you have cut all of your pieces, take your four B pieces and four E pieces. 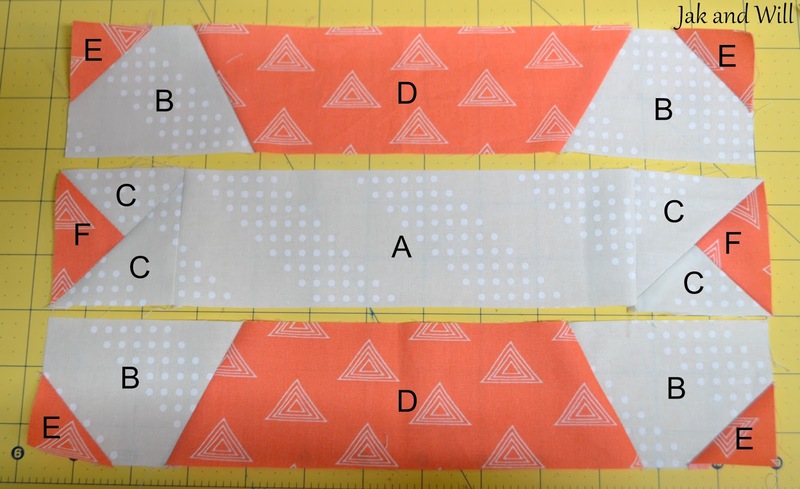 Draw a diagonal line across each of your E piece and sew them each to a B piece. 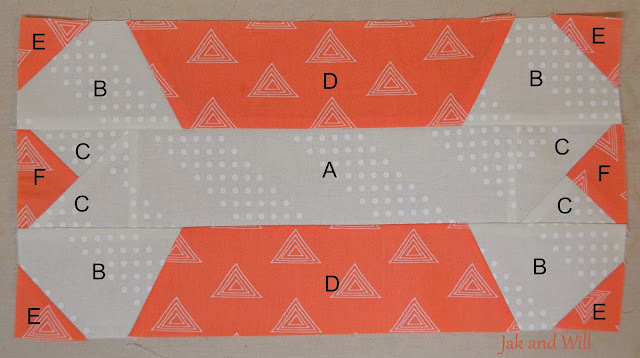 Notice that two are sewn on the top right side, and two are sewn on the top left. When you reorganise them, you'll have one on each corner. Trim the extra on the corners, leaving your 1/4 inch seam allowance and flip them to end up with the blocks above. Now you have four corner blocks. This one is a little trickier, so pay close attention! Take a block from step 1 and put it right side down. 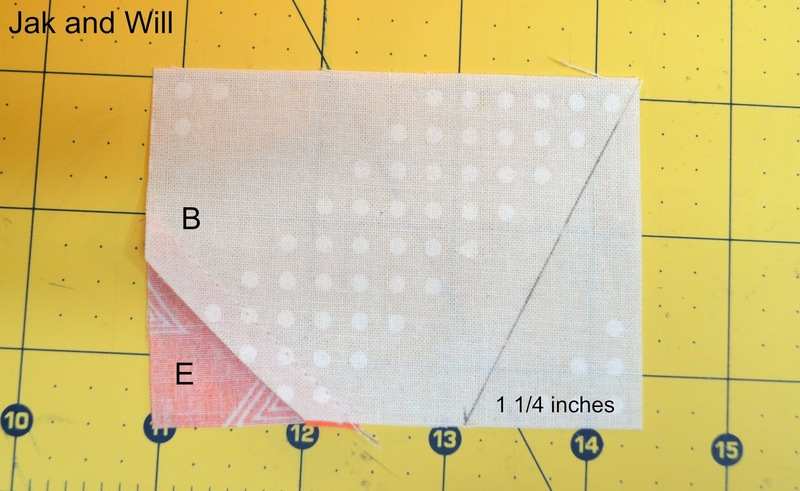 On the long edge, across from your triangle, measure 1 1/4 inch from the edge and draw a line from that point to the nearest corner. Repeat on the three other blocks. Another tricky bit, but hang in there, it will be easier. Take one D piece and one each of the corner blocks (one with the corner on the left, and the other with a corner on the right). On the long bottom edge of the D piece, measure 1 1/4 inches from the corner, then take a corner block with a triangle on the top left. Right sides together, align your corner piece so that the marked corner is at the 1 1/4 inch mark on piece D, and that the other end of the line meets the corner of the D piece. It's a bit difficult to explain, but the picture below is so much easier to follow! Repeat with the corner block that has the triangle on the top right on the right edge of the D piece. Repeat Step 3 again with your remaining corner blocks and D piece, so that you have the two blocks below. Take one F piece and two C pieces. 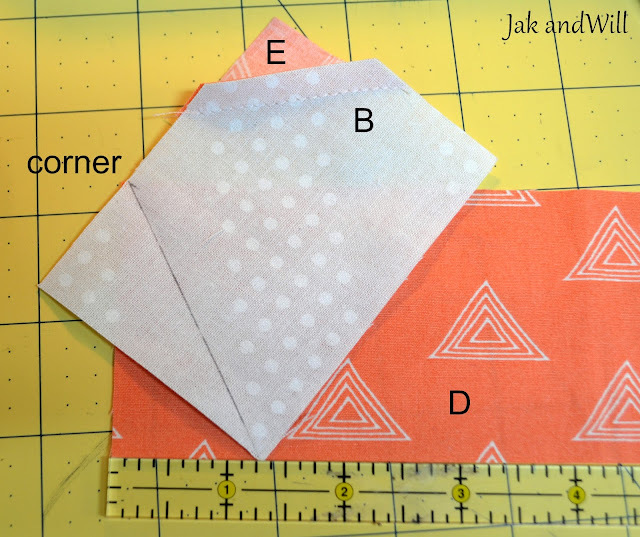 Create a half square triangle using one F and one C piece, trim. 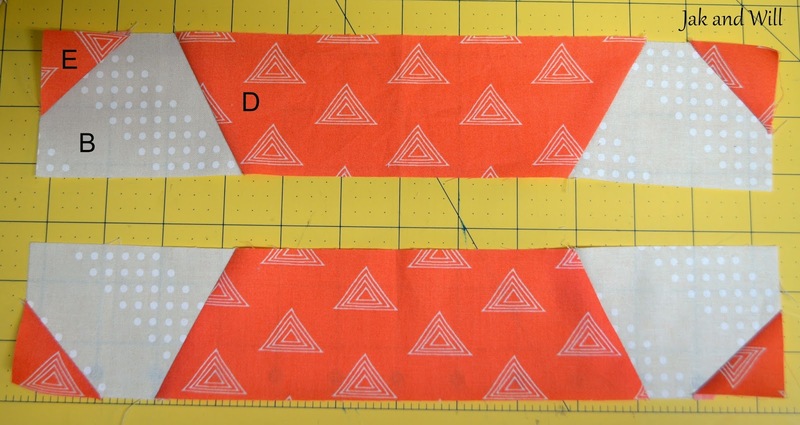 Take the second C piece, place it right sides with the half square triangle, then sew across to form the piece below. Repeat. Sew each of the blocks from step 4 on either end of block A, with the background triangles facing out. Then all is left to do is to assemble your three strip. And there you have it, a bone block to accompany your dog blocks! Do not hesitate to write if you have any issues understanding the directions. If you do make one, or two, or more, feel free to share your pictures below. What a fantastic addition to the Dog Gone Cute block! What's a dog without a bone? 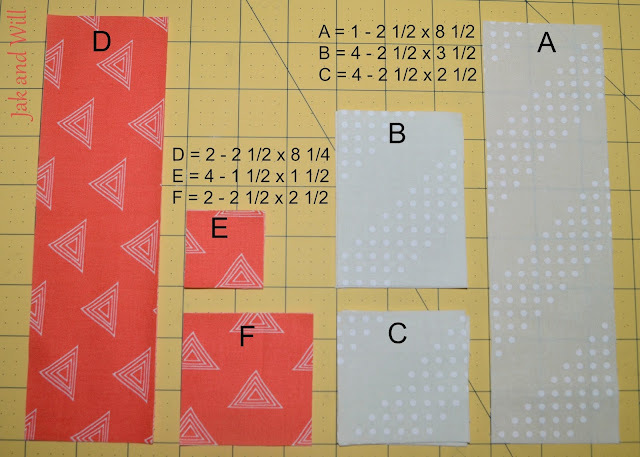 Thanks so much for sharing this fantastic tutorial, Stephanie. This is perfect! I bookmarked you tutorial. THANKS!!!! I love your little finish!! 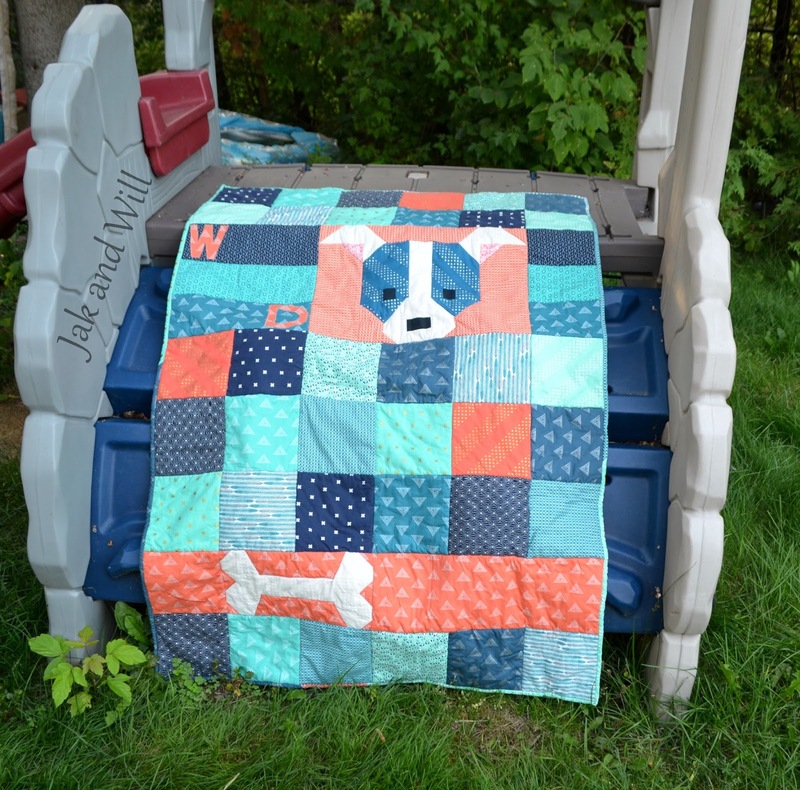 Great Dog Gone Cute quilt, and thanks for the Bone tutorial! So, so cute in those fabrics and design...love the bone addition! Thanks for the tutorial! This bone is really cute, and such a perfect addition to the doggie block! Thank you. I love the bone! thanks a million for the tutorial! You gave us a tutorial for the bone!! I saw it in your earlier post and thought man that is too cute. A big thank you. I think it is a great addition to Lorna's cute little puppies. What a great quilt! Love the tutorial too, Super!!!! Thank you. Thanks so much for the tutorial, the bone is a great addition to these quilts. I love that bone also. It compliments your cute quilt. Great tutorial! 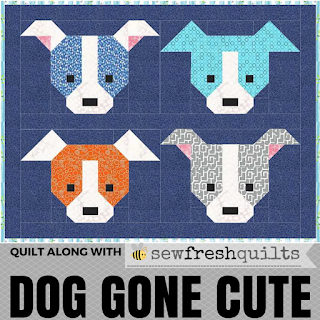 I love the patchwork around your Dog Gone Cute block. You didn't tell us what the W & D stand for? Thanks so much for the tutorial. I'm currently making another mini and a bone will be a great addition. I'll give it a try tomorrow. W & D are his initials. Such a sweet quilt and a great bone tutorial - thanks for sharing! Love your quilt! Thank you for the Bone Tutorial - this is so cute, and would make a great label for the back of the quilt too :)! What a clever little block! And it goes so nicely with the pups. 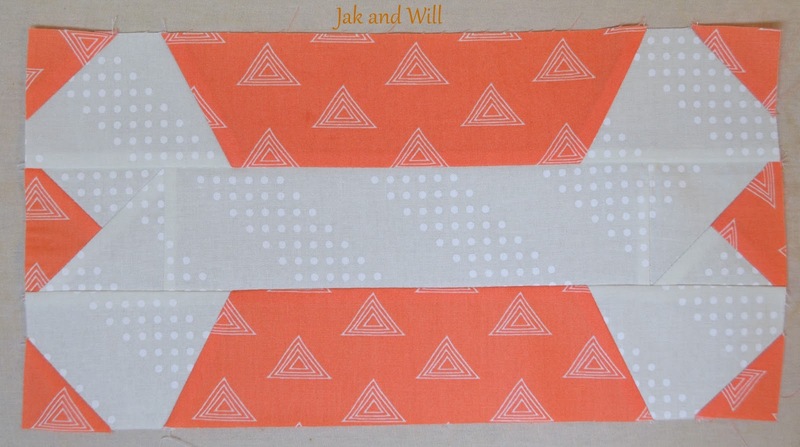 Great colour combo on your quilt! Adorable! I love your quilt and the dog bone is the perfect addition! Oh I love this bone! Thanks so much for the tutorial!! It's a cute addition to a doggy quilt, for sure!! Love the bone and thank you so much for the tutorial! 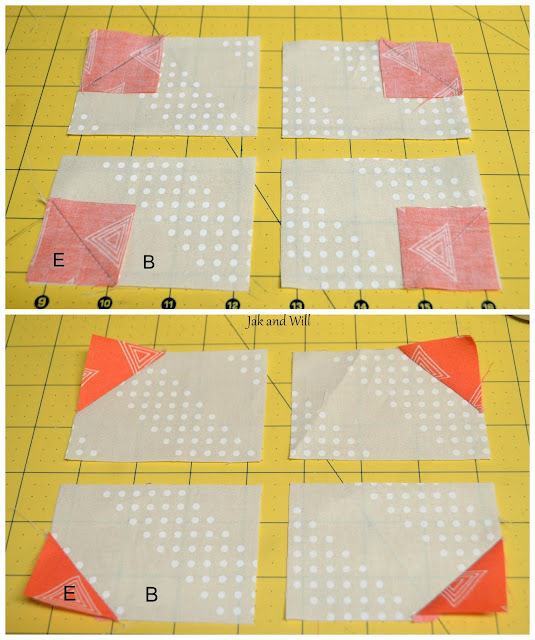 An excellent tutorial, thank you so much, and such a cute quilt! Super cute, love your fabric choices. Neat addition to the doggie block! Your quilt is fun, too--I really like the colors and fabrics. Super cute! I voted for your quilt. I love the size, the bone and the one little doggie face.